Guinea pigs and other small animals such as rabbits and ferrets need "floor time" to get some extra exercise and relieve their boredom. The latter two species can often be litterbox trained, but guinea pigs usually go potty when and where they please. That's why it's best to have some sort of enclosure when you let them out. You can buy playpens for small pets, but a kiddie swimming pool works just as well for a fraction of the price. Here are four reasons why we recommend using a pool to guinea pig owners. Hard-sided wading pools for kids are readily available at toy stores and big-box retailers such as Target and Walmart. Check newspaper ads for sales, or buy a kiddie pool at the end of the season when you'll find the best bargain. Granted, the selection might be slim, but your guinea pigs won't mind if you get an odd color or pattern. Cleaning your guinea pigs' swimming pool playpen is as easy as stripping out the bedding, taking it into the backyard, and hosing it down thoroughly. If there's a build-up of urine, simply use vinegar to get rid of it. Your pool won't get too dirty if you line it with a thick layer of newspaper, then add bedding such as Carefresh or Kaytee Clean and Cozy on top. Get rid of any wet newspaper and bedding by spot cleaning every day, then strip down the whole thing every week or so, depending on how much time your guinea pigs spend in the playpen. When you first get a guinea pig, it can be challenging to assemble its cage. It can take quite a while to make the piggy's new home resemble the pretty picture on the box, as it comes in a mass of confusing pieces. But a plastic swimming pool is ready for your guinea pigs as soon as you get it home. Just add bedding, and voila! They've got an instant playpen. Of course, you do need to add some accessories to keep them happy and engaged. Try igloos and other places to hide as well as some tunnels and a pile of hay. Fasten a grid inside the pool so you can mount a water bottle, too, if you leave guinea pigs in the swimming pool for several hours at a time. Since the swimming pool is a playpen, the operative word is "play." Enrich the environment to get your pigs at least a little active. Many like to just hang out in their hiding places, but tunnels and toys might entice them to get some exercise. Keep the swimming pool playpen on the floor in the family room while you work or watch TV. When you want to clean the pool, it's light enough to simply roll out the door once you've removed all the bedding. When you need to store it, take it out to the garage. Even though you can easily pick up and move a swimming pool, always keep it on the floor when your guinea pigs are out playing in it. Although the walls are high enough, your pets can jump out if they're startled, perhaps if they hear a loud noise. 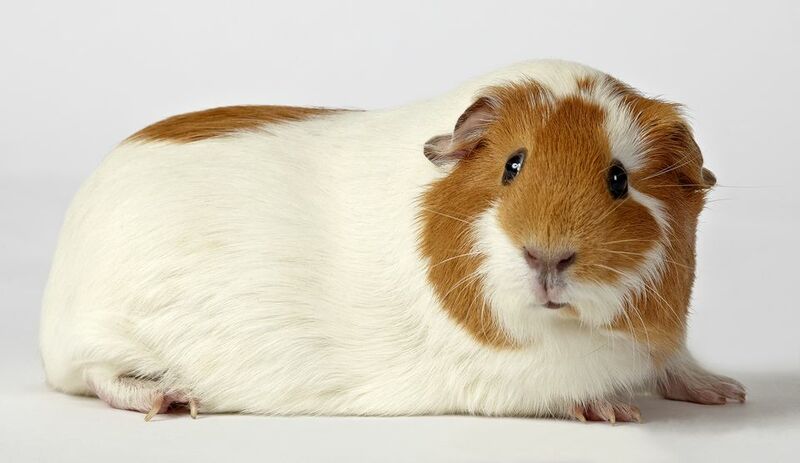 If the pen is high off the ground, a guinea pig could die if they jump out and hit the floor.